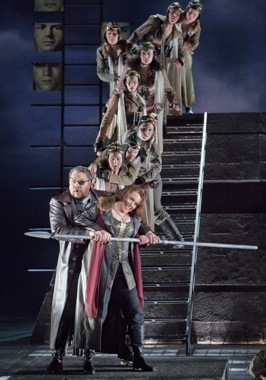 The second instalment of the Ring Cycle revealed to be a crescendo in the architecture of this San Francisco tetralogy – both from a dramatic and from a musical perspective: a Germanic quality in the musical rendition and a nexus of complex personal and political relationships came strongly to the fore in this Walküre. 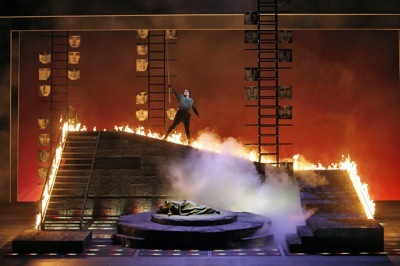 This production was first seen at Washington National Opera and it represents a historical progression from the preceding part: if Das Rheingold is set during the Gold Rush era, Die Walküre proposes a twentieth-century capitalist world in which greed, violence, and hypocrisy have infiltrated everyday life and personal relationships. As I have noted in my previous review of the same production, some of the imagery of Zambello's production resonates with Patrice Chéreau's Bayreuth Ring, set during the industrial revolution. Yet, the references to the Iraq and the Afghanistan Wars, and to environmental issues, grant this production distinct – if also problematic – subtexts. My major concern with Zambello's vision is the danger of flattening the differences between historical moments that, while tragic and topical, are not analogous. Nonetheless, I am convinced that Zambello's production is successful in its sustained interest in privileging personal relationships over grand historical forces. Also, it pays homage – through the presence of numerous symbolic places and images – to the soldiers who died in several American wars. Another element of success in this Walküre lies in the interaction between the performative space and the electronic component. 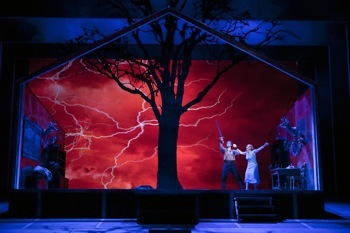 The various digital projections that seemed redundant in the staging of Rheingold were less invasive in this case, and proved to be always functional to the narration. Such is the case of the transition between Hunding's hut in the woods to Wotan's office in the skyscraper-Valhalla: a vertiginous sequence takes the audience from the wilderness into a crowded urban space, conveying a sense of displacement and suddenness. The backdrop projections complemented the action on scene without overwhelming it. This is the case of the dark clouds signalling the beginning of the duel between Hunding and Siegmund in act II, and the approaching of a raging Wotan in act III. The sets, designed by Michael Yeargan, were convincing in their simplicity, though overly cautious. I found particularly effective Wotan's office with its huge windows gazing onto a smoggy city, and the abandoned overpass crowded with garbage as the site of Hunding and Siegmund's final, and fatal, encounter. The last act was set in a grey and desolate space with a circular flat stone at its center: from the programme note, we learn that it was inspired by the ruins in the proximity of the battlements in the Presidio and Marin Headlands. For me, what made this Walküre a special achievement was Nina Stemme's flawless performance as Brünnhilde. From the moment she ran onto the stage and into his father's arms – in the playful and beautifully choreographed first scene of act II – she brought her charisma and warmth which truly made the human dimension of this Ring come alive. All her vocal gestures were utterly refined: she explored a wide range of colours in her phrasing, always succeeding in finding the appropriate shade to portray the complexity of her role. In the second scene of act II, her ability to respond sensitively to the other characters' emotions was manifest: her body and her voice were completely engaged in response to Siegmund's resigned and then defiant attitude – after her announcement that he was bound to die and required to go Valhalla, without his sister and wife Sieglinde. The climax of her performance was in the confrontation with her father in act III. As she found the courage to face his rage, she gave life to some of the most heartbreaking lines of the performance: "War es so schmählich,/ was ich verbrach, /dass mein Verbrechen so schmählich du bestrafst?" 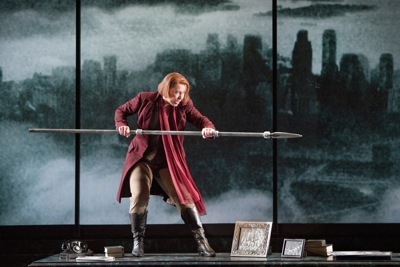 Mark Delevan's Wotan, as well, came touchingly alive in act III. Unfortunately, his vocal performance was unconvincing: his timbre is not robust enough to support the lines that his role requires. Nonetheless, he was able to portray a fine Wotan, as his acting is very sophisticated and always expressive, and he was able to bring to the fore most intimate and self-destructive qualities of his character – his failure not only as a god, but also as a father. Anja Kampe's Sieglinde and Brandon Jovanovish's Siegmund represented a refreshing opening of the performance, during their interaction in act I: they both possess vigorous, bright and dense timbres, and they are a wonderful vocal match. Together with Stemme, Kampe shone on stage: she was a wonderful Sieglinde, initially helpless but always secretly determined to rebel against her abusive husband. Her hallucination scene in act II was a masterpiece: in her singing, the repression to which she was subjected and her tragic ability to foresee the tragic events to come were powerfully manifest. Jovanovich's first Wagnerian role was a success in many ways, too. On the one hand, he took some time to warm up and had some problems of intonation during the faster phrases, especially in act I. At times, he was overly self-conscious; unfortunately, that was at the expense of inhabiting his character in a more affecting manner. On the other hand, I can imagine how in the forthcoming performances he could easily improve: his soft yet powerful timbre is perfectly suited for the role of Siegfried – he could sustain his lines even during the most delicate pianissimo moments – and he seems to possess the vocal qualities to build a character that is solid under all aspects. An additional feature that I think stole some of the intimacy and solemnity of Siegmund and Sieglinde's mutual recognition was a somewhat excessive sentimentalism and pathos in the choreography: both performers were constantly moving – often frantically – from one side of the stage to the other. While this appeared to signal a sense of catharsis and exhilaration, I felt that at times their constant mobility was unnecessary and distracting. Elizabeth Bishop, once again, built her Fricka as a convincing character: she delivered her lines with clarity and precision, communicating genuine concern for the incestuous relationship between Wotan's twins. She also demonstrated special sensitivity in regard to Wotan's tendency to violate all contracts – including the marital one. The Valkyries chorus was impressive, too, especially in its choreographic aspects and in the harmony they reached when singing together; although, some of the solo performance were overpowered by the orchestra. Daniel Sumegi seemed not able to meet the dramatic and vocal needs of his role as Hunding. Donald Runnicles showed a great command of the score from beginning to end. His conducting seems to be characterized by the absence of grand gestures and extreme contrasts. Such an approach to the Wagnerian score has several effects: the singers are given the trust and confidence to develop a space in which they can explore unusual and interesting dynamics, and the more intimate and delicate passages are given priority over other scenes. In fact, in this particular reading of Walküre, some fleeting orchestral passages stand out as extraordinarily beautiful moments. Such were the bars played while Sieglinde was offering Siegmund some water: the music's caressing of that passage was embedded with intimations of the love unconsciously alive between the two siblings. However, I felt that some of the most energetic moments could have been explored in a sharper fashion. There were a few imprecisions from the brass sections, but, as in Das Rheingold, the harmony between stage and pit was remarkable.